Holiday Community Partners work with us to provide support to military families, wounded heroes, deployed service members and veterans during the holiday season. 2019 Holiday Community Partner Program is currently closed. Please check back in the fall for more details! Community Partners team with Soldiers’ Angels to provide support to military families, wounded heroes, deployed service members and veterans. They can be individuals, families, civic groups, businesses, churches, schools, scouts, sororities, or youth groups who have a desire to serve military families. Holiday Community Partners work specifically during the holiday season to provide cards, letters, and stuffed stockings for our troops and veterans. As combat deployments have drawn down many charities, including Soldiers' Angels, have discontinued the acceptance of holiday cards and letters to the troops- the volume of cards and letters exceeded our distribution abilities. While most charities will not, Soldiers' Angels will continue to accept your holiday cards and letters from our Holiday Community Partner members only! Each card and/or letter must be placed into a stocking filled with goodies for our troops and veterans. 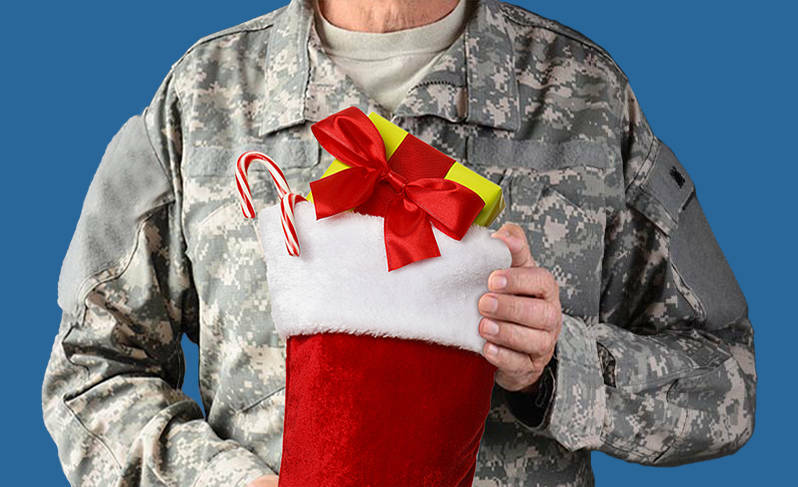 Soldiers' Angels will deliver your stockings to a deployed service member or veteran patient. Soldiers' Angels will accept registrations for the Holiday Community Partners program now until we reach our capacity to distribute the stuffed stockings. Stockings must be sent to your designated area representative no later than December 10, 2018. Participants are responsible for any and all shipping costs to get the stockings to the address provided by Soldiers' Angels. Please do not ship your stockings to Soldiers' Angels Headquarters in San Antonio unless you are directed to do so by the coordinator. All food items should be store bought. If you are interested in baking, please check out the Soldiers' Angels Angel Baker Team. A knit stocking cap makes a great fastener and a useful item to include. Please see image. Please ensure you carefully pack the stockings with newspaper, packing peanuts, or bubble wrap to ensure minimal damage to stockings during shipping. Please do not ship in extra-large boxes and keep box weight to less than 40 pounds. Please remember to enclose either a small card or handwritten note inside the stocking to let the service member or veteran know you’re thinking of them. Thank you for your support and let’s bring a little cheer to their lives this holiday season!